As reported last week, the Miami Dolphins filed a UDRP for the domain name, Dolphins.com. 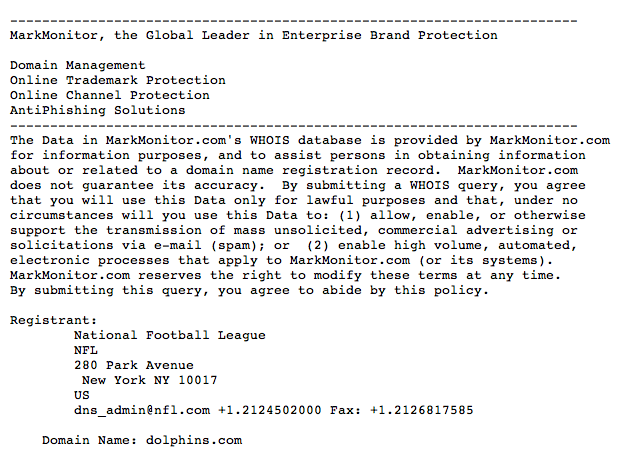 According to domain registrar and brand protection company, Mark Monitor, Dolphins.com is now owned by the National Football League (see screenshot below), although the DNS has not been changed nor the domain forwarded to the Miami Dolphins website. A few days ago, I noticed that the status of the UDRP filing was listed as Suspended, and now the domain name has been transferred, despite the current PPC links. A Suspended proceeding generally means that the two sides either reached some sort of agreement about the UDRP proceeding or a lawsuit was filed to prevent a ruling. Although I don’t have any details about what was worked out in private, perhaps it will be reported in a future public corporate filing. though they might have a harder time on that one. what about cowboys.com that all these domainers got together and bought…what’s going to happen here? Jets.com and Cowboys.com do not appear to be infringing on anyone’s intellectual property. Both are generic terms and can be owned legitimately by people other than the NFL or its franchises. They may have the domain name, they may have JLo as an owner, but they will not have another Lombardi trophy! And Dolphins isn’t a generic term? Honestly, when I saw the headline with Dolphins in it, the Miami Dolphins was definitely not the first thing that popped into my head. In my opinion if the NFL able to get a generic TM on the term Dolphins, then the registrar’s office was way too lenient. Perhaps you didn’t see the screenshot in my last post and/or didn’t visit Dolphins.com, but the content doesn’t appear to be generic about dolphins (the animal) but focuses on the Miami Dolphins football team. I don’t think you understand the whole situation or regulations. Another example would be that I could own Apple.com if I was selling apples, apple juice or apple sauce. I couldn’t own it and start selling computers, phones or other related items in which Apple, Inc has trademarks. If you visit Jets.com and Cowboys.com, there is no mention of either football team. “Dolphins” is a generic term as well but “Miami Dolphins” is not. Yes, but they were advertising Miami Dolphins PPC links on the parked page. When I re-read your post Elliot as well as the details of the WHOIS record, it dawned on me the registrant is the NFL, not the team itself. The NFL is the only major US sports league where the teams run their own Web sites. Sure, there is NFL.com, but look at the other leagues – NBA, NHL and especially MLB – and they all have uniform Web sites. I have a recollection – I unfortunately don’t have the facts to back me up, but it stems from living in the Boston area for years and running a Pats fan Web site, GoPats.com, that I remember this – but there was a vote by team owners and it was decided each team would own and run a separate Web site. From what I recall, the 2 owners who drove this decision were Kraft of the Pats and Jones of the Cowboys, as both of them owned media companies and wanted their own control. Looking at the WHOIS on patriots.com, the Kraft Group owns it, where looking at the WHOIS on cowboys.com… well, we know what happened there! This was probably the NFL stepping in and negotiating a deal. They surely know what happened with cowboys.com as well as angels.com with the MLB and surely wanted this issue to go away. Again, it’s speculation, but they have to do something with the money that are making off of merchandising and all the other smart deals they make. This is why I always say if you are going to spend money, do it strategically, and not just on lawyers. Hello, RIAA!